When I started learning about Astrology and the "ages" I got pretty curious about how everything worked and what the consensus was about the coming age. I kept hearing about this being the Pisces Age and the ages are playing backwards (retrograde) as opposed to the actual horoscope signs i.e. in horoscopes Pisces comes AFTER Aquarius, but in the "ages" of existence (based on astrology) scenario it's Aquarius that we're coming UPON. An age, from what I learned, is essentially a 2,500 year span (by one account) of time where human kind is supposed to experience an "age" much like growing kids. 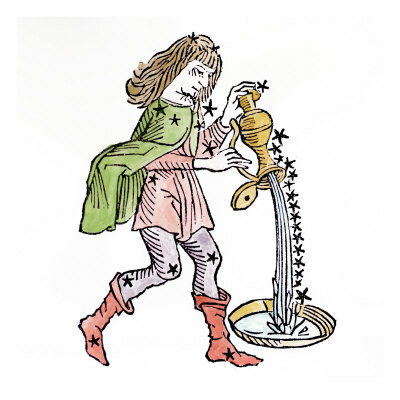 Aquarius is likened to us reaching our mature young adult years in this existence. It's an age of a "free mind", meaningful relationships, crystal science's all time high, and none of us can actually fathom it (but the song "The Age Of Aquarius" makes you think your already there, in a utopia from what the lyrics promise). What's Different Between This Age (Pisces) And The Next (Aquarius)? The current age is supposed to have the motto "I Believe". You can imagine how this matches up with religion. The next age's motto is "I know" which coincides with our current future because of "the information age" and a highly accelerated learning and evolution rate (we're getting brilliant). This is a 50 year period where a transmutation of how we think, how we live, and life in general morph into another age or attitude, a completely new way of "being" but retaining everything we know from the last age. It's supposed to be a seamless entry, one that has hallmarks of events and changes in attitude and things of that nature. (Like seeing life in the 1870's and warping to today but much more enlightened). If it's true, mankind is in for a heaven on earth type of existence in the next age. If it's not, well, it's sure a wonderful thought isn't it? The end of an "age" means the beginning of another. This brings light to the many people out there posing as billboards and screaming "the end is near". Might they be talking about the end of destructive living and the beginning of an information age meets the Aquarius age which is labeled "The Relationship Age"? Or does the utopian "vibe" being given to this next age sound so good it offers an "avatar" moment to the imagination? The end of the world, in this respect, is a 50 year transmission between one age and another- not death per say, of people, but of a way of thinking into another state (weaning out of one consciousness and into a new one down to reproduction of the species). The change over is not just a growth up, I hear, but rather an entire consciousnesses shift, paradigm shift, and all around reset to a new sandbox, so to speak. We're like kindergarteners in the new (Aquarian) age. We know only the basics of the world we live in and slowly evolve over 2,000 more years to the next age, reaching enlightenment of the last level. According to one guy, the 50 years between the change are the consciousnesses in school (through life's actions) being actively debriefed in the new existence you're evolving into. It's even been hypothesized that even the very laws of physics as we know them on this planet will shift because of profound changes the changeover will cause (beyond our comprehension of the forces involved and why) with the universe. Let us Explore more on the more logical consensus. "It's The End Of The World As We Know It And I Feel Fine"
What Does The Aquarian Age Look Like? 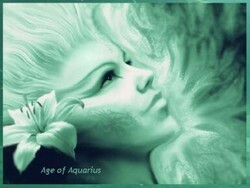 The Aquarius Age is known as the new age that supersedes the Pisces age of existence ("I Believe"). The age of faith and the entire way of life as we know it will (is said to) end by the year 2050 when the "dawning of the age of Aquarius" starts. This is what the end of the world means. The end of one age and the beginning of another. This last age was the age of growth from physical to spiritual planes of existence. Where we did more on the physical plane than ever but leading to breakthroughs in science and mental health, comprehension of the human body and our very potential. The Age of Aquarius will be something different all together but that will retain the best parts of humanity and elaborate on them at a higher plane. A lot of people have different ideas of what the Aquarian age would be like but everyone pretty much lands in the same utopia place (common denominator). This is the new age that evolves us from "I Believe" to "I Know". Human beings aren't the only ones with "star signs" everything has a horoscope and a meaning based on that zodiac. The zodiac is not just a way to describe your "destiny" it is also a way to personify an age, an existence, a realm of existence. The age of Pisces will end (graduate to Aquarius) between the years 2110-3000 the "dawning of the age of Aquarius" is believed to have completed the transformation of consciousness. This is what the end of the world means. The end of one age and the beginning of another (with a tapering up process). This last age was the age of growth from physical to spiritual planes of existence. Where we did more on the physical plane than ever but leading to breakthroughs in science and mental health, comprehension of the human body and our very potential. The Age of Aquarius will be something much cooler. It's said to be an easier time- a 2,000 year vacation from anything that currently ails you! (running through the entire age). The Pisces age is said by some to end about the year 2110. Some say 3000. Then the Aquarian Age begins. The next age will be Capricorn (I'm a Capricorn) some say around 5,000 A.D. In astrology the positive aspects of the age/sign are generally the one that define the age's "personality". Capricornian traits would mean a time of great initiative and networking/cooperation. We'd have to man up, relearn discipline and responsibility. This would come after experiencing for so long the dreamy idealism of the Aquarian Age. It will put us into a more angelic like existence where by we learn how to work together, to grow without selfishness to grasp a more mature spiritual existence where relationships aren't necessarily based on marriage, love, family, bonds, ties, and so on, but more about comprehending how the whole fits together yet has its individual parts. Synergy. Everything we now know will no longer exist by the year 3,000. It will be remembered if at all like we think of the cave men, barbaric, ignorant, and ridiculously selfish in nature. The world will care more for its environment than its own individual needs. The people will care more about coming together than who has the most. Money possibly won't even exist for it will have no place. Their will be no "powers" "countries" "Nuclear power/missiles" etc.. Any more than their were a million years ago. Many things may happen but unfortunately for this kind of a change to happen we have to destroy the remnants of what was and force people into a whole new way of understanding their existence. So long as history records a full and unshakable reality of what we now understand we will continue to live by that template of existence and nothing will change quickly enough. What's interesting to note is that most of our data new and old is being moved to digital mediums where it can more easily be erased- by the sun casting off a solar flair! The template must be destroyed to give people no other crutches to live by and for them to reach in the only place left to understand life.. Themselves, their internal instincts.. yet now with a developed psyche maybe even technologies that make the next age possible. What if these are being created and evolved (to solve problems, ail stress and so on) now as we simply try to create better computers, biofeedback devices like that ball that floats when you just think about it from a remote controlled biofeedback actuator! So there you have it. The story of the dawning of the age of Aquarius. I had a great time researching and finding all the data I used to compile this "book report" of what I found. You don't have to believe it to enjoy it, but I for one am hoping the age of Aquarius is everything it's said to be. We could use a nice utopian break from all the wars and ridiculousness in the world! It's great to be reading this while sitting on a settee in Glastonbury. The Age of Aquarius has certainly been pre-empted by this town! I love what you've written here and I can also add some cultural history. The astrological ages are linked to whatever zodical sign is rising during the vernal equinox. This is a slow process, taking thousands of years to switch to the next one. It's been an important celestial marker for human beings over the millennia. For example, when it was the Age of Taurus, we saw bulls turning up in Egyptian architecture; the legend of the Minotaur gained popularity; and the God Mithras became important to the Persians (spreading later throughout the Roman Empire). When it was the Age of Leo, then we get lions turning up in great monuments like, for example, the sphinx. We've been in the Age of Pisces for a while and what is the great symbol of one of the prominent religions? The fish of Christianity. These things are not coincidental. It's the great spiritual leaders harking to the celestial pointers. If you can 'own' what is rising on the vernal equinox, then you 'own' the spirituality of that age. by Tessa Schlesinger. The year of the water snake traditionally brings many challenges and disasters. It's a year of obstacles. Learn what you need to do to get through safely.